← Given a list of users, get distribution groups they manage ! I am writing this blog post to document the steps I went through to create a corporate Windows 8.1 Image. I found a lot of ways and options in the internet talking about advance ways to do such image, like WDS, MDT, SCCM Zero/Light touch deployments. That’s cool actually, but the requirement I have is: Give me an ISO that has Windows 8.1 Image that is customized. Saying that, I have to do all customizations packaged inside that ISO. One recommendation here is to create an updated custom image every 3 months, so that it contains all the windows and application updates. Keep a good version information in place so you can track your custom images. I also avoid creating any custom refresh image with all apps installed in my image for a good reason. I want the IT teams to always check for newer version of my custom image that I produce every three months, instead of deploying the first release of my custom image and then use the custom refresh that ships with it to sort any problems. This way, if the local IT teams have a problem with one machine, they will check for the newest image version of Windows 8.1 that I have made and not rely on the outdated custom refresh image. The steps described below is a collection of knowledge from Microsoft TechNet, webcasts, blogs and practical experience beside trial and error. Trial and error is my best friend when it comes to deployment, so here is how I did it. 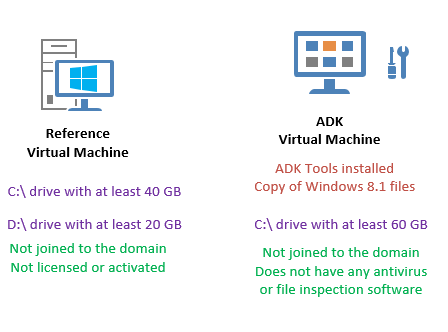 Prepare two virtual machines: “ADK Machine” and “Reference Machine”. Use ADK machine to prepare unattended xml file. Use ADK machine to prepare a bootable WinPE disk. Install all software and patches in “Reference Machine”. Boot the reference machine in audit mode. Perform advance customization to the built in administrator profile on the “Reference Machine” and run sysprep. This will cause the “Reference Machine” to shutdown”. Inset the WinPE disk to the “Reference Machine” DVD virtual drive and boot the “Reference Machine” from it. While in the WinPE environment, capture an image from the “Reference machine” and save it to the “Reference Machine” D:\ drive. Boot the “Reference Machine” normally and copy the captured wim file to the ADK machine. Go to the ADK machine and use ADK tools to mount the wim file, inject a GVLK, remove any metro app packages, and unmounts the wim file again. Now, you can generate ISO file from the resulting wim file on the ADK machine. Tip: you can use that wim file generated from step 11 on your WDS server and network deliver the customize Windows 8.1 image, or you can just use the ISO image generated from step 12 to burn it in to USB and deliver the image physically to target machines.